Aqua Expedition’s luxury 3 night cruise on the Amazon River aboard the Aria Amazon begins in the remote colonial city of Iquitos(IQT), Peru and transports guests in exceptional comfort deep into the Amazon rainforest, along the Marañon River, the Amazon’s largest tributary, as well as other neighboring rivers (the Yarapa and Yanayacu-Pucate), each one rich in vibrant wildlife and thriving rainforests. Go fishing for the many species of Amazon fish, explore into the dense jungle on foot in search of three-toed sloths, toucans, macaws then come back to the comfort of our skiffs to meet taricaya turtles in their natural habitat and hunt for endangered pink dolphins, unique to the Amazon, at play. As the Aria Amazon journeys towards the union of the Ucayali and the Marañon Rivers, considered the birthplace of the Amazon, learn from our experienced, English speaking naturalist guides about the diverse Amazon wildlife and birds of the Pacaya-Samiria National Reserve. The path the river cruise takes changes depending on the water level as shown below. Rise with the sun for an early morning birdwatching along the Marañon River. After breakfast, we will take a jungle walk on the firm soil forest “Casual,” while looking for flora and fauna which include medicinal trees, insects, and poison dart frogs, and learning more about the different rainforest stratas. Later, swim, canoe or kayak in Yanayacu-Pucate River as we look for legendary pink river dolphins. Focus our hi-tech telescope on the night sky to identify the planets and constellations. This evening before dinner, we will gather to introduce you to some of the crewmembers whom you may not have met, working "behind the scenes" to ensure your countless exceptional experiences aboard the ARIA AMAZON. This itinerary is based on the High Water Season (November-May), it varies slightly for the Low Water Season (June–October). All itineraries are subject to change, due to weather and other conditions. All times indicated are approximate, and are also subject to change. The 147-foot-long Aria Amazon was entirely custom built by Peruvian architect Jordi Puigto offer an extraordinary level of comfort for our guests and was launched in April 2011. The Aria Amazon can accommodate a maximum of 32 cruise ship guests plus crew. This luxury cruise ship is the perfect size to sail along the Amazon River, providing extremely comfortable lounge, outdoor jacuzzi, exercise room, dining and sleeping accommodations and modern navigation technologies and standards for cruise ship travel and safety on the water. The Aria Amazon’s sixteen oversized Design Suites, feature en suite sitting areas and generous outward-facing picture-windows with panoramic Amazon river views. Each of the handsomely decorated, air-conditioned suites measure around 240 square feet and can be either twin beds or converted to a Californian king-sized bed. Each cabin has a sitting area and a well appointed bathroom, complete with all necessities, plus a shower that has hot water around the clock, a hairdryer, and a basket of luxury toiletries. The fine Peruvian linens, with a thread count in the hundreds, sooth you to sleep with a sense of elegant luxury. And there is an internal communication system, to facilitate announcements. All cabins also have safe deposit boxes for your valuables with instructions for their use. The Aria has 24 staff and crew, including a cruise director and four English-speaking naturalist guides. Shpi facilities incldue an Indoor Bar-Lounge, Dining Room, Outside Lounge, Outdoor Jacuzzi, Exercise Room, Observation Deck, Boutique, Four 8-Passenger Skiffs. 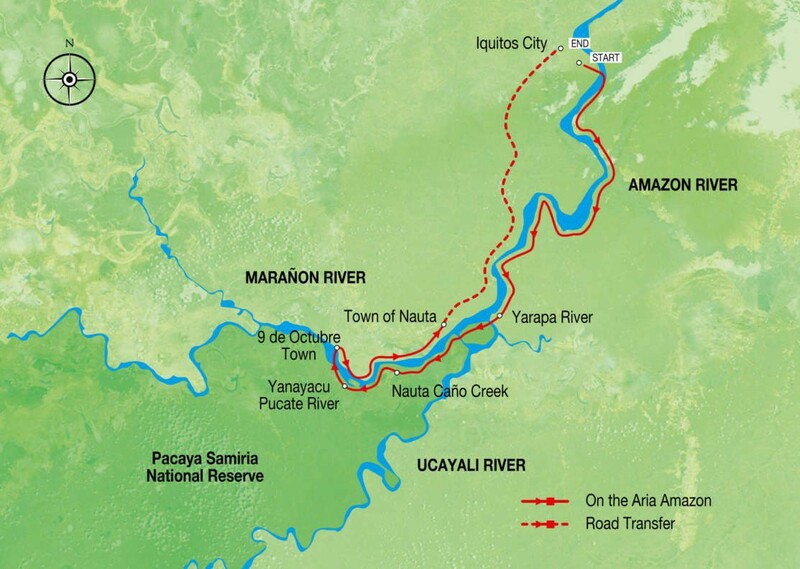 We highly recommend our 7-night Amazon River Expedition Cruise on the Aria Amazon where you may experience our most luxurious and comprehensive Amazon journey among the Amazon River’s three powerful ......click here to read more. Aqua Expedition’s luxury 3 night cruise on the Amazon River aboard the Aria Amazon begins in the remote colonial city of Iquitos(IQT), Peru and transports guests in exceptional comfort deep ......click here to read more. This 4 night luxury cruise on the Aria Amazon begins in the remote colonial city of Iquitos, Peru and transport guests in exceptional comfort deep into the Amazon rainforest, along ......click here to read more.